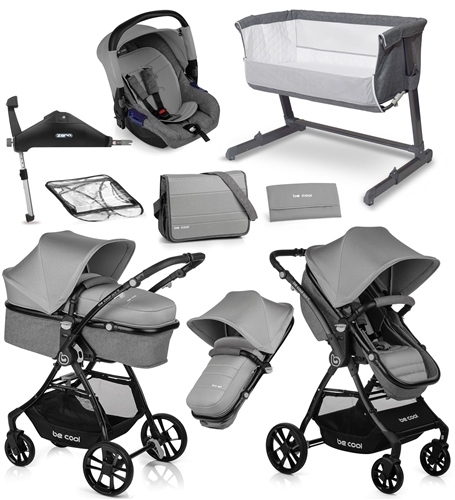 We've made it easy to get your new arrival out into the world with this convertible 3in1 travel system and Nursery bundle starter pack. One package takes the hassle out of looking for a bedside crib, pram, pushchair, carrycot, car seat and coordinating accessories separately. 1 x Zero Group 0+ infant car seat. 1 x Coordinating Pram bag with changing mattress. 1 x Apron / footmuff cover. 1 x Cozi Sleeper bed-side crib complete with 2 FREE packs of fitted cotton sheets. T wo-part pushchair that includes a seat that converts into a carrycot without having to fiddle about with any straps, with just a simple click the seat becomes a comfortable carrycot with enough stability and rigidity to be placed on the floor. Includes a comfortable mattress for when it is used as a carrycot. The chassis has a very simple and compact folding system. This convertible seat along with the baby carrier make it a complete, handy, and economic option to cover all baby’s needs for getting about. Zero Group 0+ infant car seat. Keep baby close with the Cozi-Sleeper crib. Suitable from birth until baby is 9kg. KOOS & ZERO infant car seat installation with seat belt or Isofix base in the car.